Intent-based networking is the difference between a network that needs continuous attention and one that simply understands what you need and makes it happen. It’s the difference between doing thousands of tasks manually and having an automated system that helps you focus on business goals. 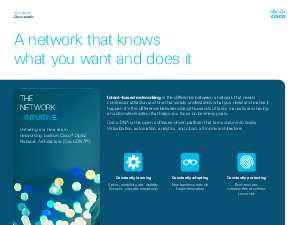 Cisco DNA is the open, software-driven platform that turns vision into reality. Virtualization, automation, analytics, and cloud, all in one architecture.